Why start an organic vegetable garden? There is no reason to if you like eating fertilizers, pesticides, antibiotics and a whole list of other chemical. Most of the non-organic food you get in the local grocery store today was given something to make it grow faster and be more disease resistant and last longer on the shelf. Meats and vegetables. 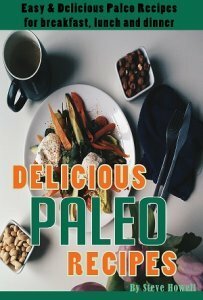 Besides, there isn't anything like the delicious tastes associated with foods that are from a natural and organic farm or garden. Being able to grow an organic vegetable garden is not out of the realm of possibilities for people in urban or suburban areas. Even apartment dwellers can start a window garden. Not merely are you planting fruits and vegetables which are high quality, they are also healthier than what you would get at the local grocery store or mega-mart. Beginning an organic and natural vegetable garden starts off with setting aside the room required to grow the kinds of produce you desire. Most of the time, if you have never grown a garden before, ensure that it stays tiny. You could expand next season when you've got know-how. For your first effort, only focus on a few plants and gain the ability you need to expand the next time out. You will need to locate your organic vegetable garden where it can get the proper amount of sunlight, so a south facing location is always good. Generally, veggies need to have at least six hours of sun every day, so putting the garden on the south side of your space will maximize exposure. Unless you live in forest that is. If you do then cut down some trees. Having water nearby would be a good idea too. I have to drag out 300 feet of garden hose to get to my garden. I plan to install a facet next to the garden this fall. Of course I planned on doing that last fall. And the fall before. Whatever you grow starting out should be adapted to the area you live in. You can grow plants that are from other regions but it is going to take some extra effort. You won't be able to just plant and water. Should this be a first organic vegetable garden, it's wise to just choose the sort of vegetables that do best. Keep it simple. When you located your organic vegetable garden, you will need to make sure it is fairly level to keep the majority of the rain from running off prior to it soaking in. When you've got trees or possibly shrubs in the area, you might want to surround the garden using a trench to keep all their roots from absorbing water before your produce can. 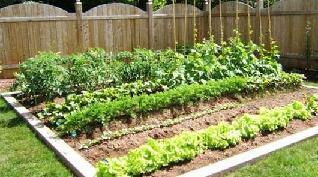 Use raised beds for smaller organic vegetable gardens. It is a much better use of space as compared with growing in rows. Raised beds provide for excellent water drainage plus lower weed control. These are a couple of my beds and my greenhouse. I also have a couple of beds that were made out of straw bales. Two high. This allows me to sit and weed instead of bend and weed. Your beds should be filled with a growing medium that is very high in organic material. I you are just starting you may have to buy your medium depending on your soil conditions. I start a new bed by putting up the frame and then breaking the ground with a potato fork as far down as I can. Then mix in a good amount of compost. Plant and cover with straw. 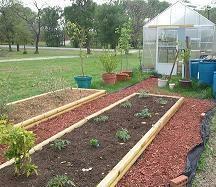 Growing an organic and natural veggie garden has become a great hobby and pastime for many people worldwide. It is a great feeling to be able to go to the back yard and get some great tasting veggies. Veggies that you know were not subjected to the chemical baths of some of the veggies in the grocery store. Be sure to ask the experts for advice when you are starting out and in a brief period you'll have a “green thumb” as well.